Apple has a new pro app for audio production called Soundtrack Pro, unveiled with Final Cut Pro Studio 5.
matching to sound to picture. 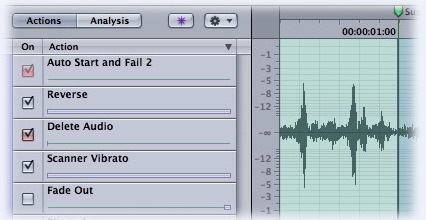 histories of edits for "what-if", non-desctructive waveform editing. Think Photoshop layers and history for audio. Find-and-Fix: Automatically identify and repair audio problems like clicks, pops, and noise. 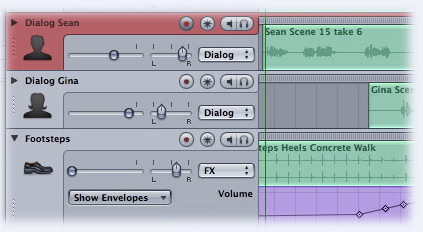 Fully Automated: Integrated AppleScript support and OS X Tiger Automator support for fully automating audio workflows. Apple Loops Comes to Sound Effects: Doing video production? Take note: on top of the (expected) 5,000 Apple Loops, you can surf 1,000 included sound effects. settings from audio and applying them wherever you like. Integrated Mixer: Mix audio in a more Final Cut-like interface, with full control surface support and out-of-the-box Mackie Control support. last version of Apple's video suite. Logic, this product says Emagic throughout, from mixing to effects. 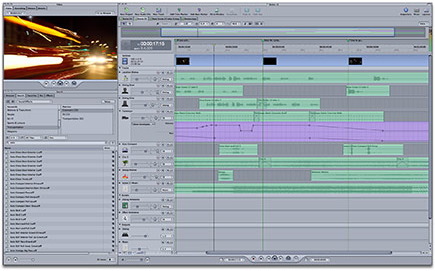 start doing audio editing in Soundtrack instead of Pro Tools.